Heh, two months since my last update. 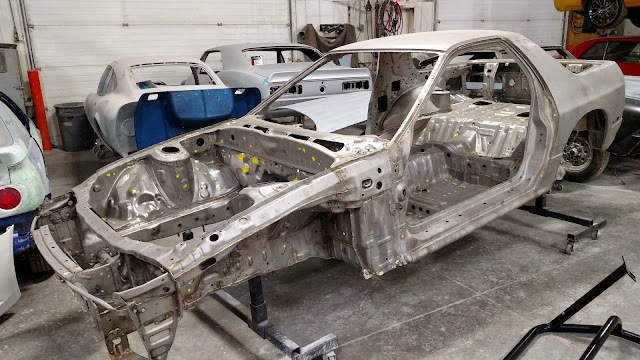 The car is completely stripped and at the body shop. The first order of business is a full sand blast to figure out what needs to be fixed, patched, or replaced. 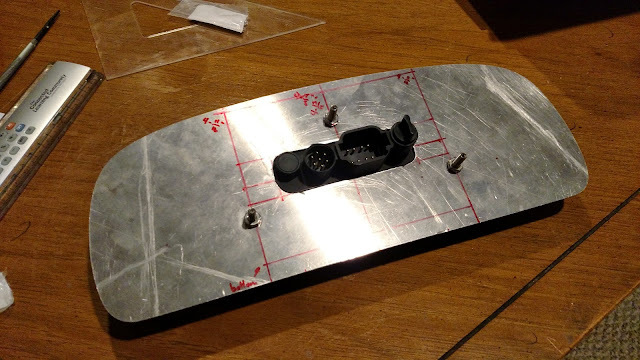 The remaining round holes allow everything to fit around that inconvenient front bar the FC has. I decided to leave the back of the oil cooler open to the radiator because I'm concerned the radiator wouldn't get enough flow if they were completely separate. It's not perfect - I used what I had available. I'll probably add some weatherstripping to the edges that'll contact the body, oil cooler, and radiator to protect them and maybe seal a little better. That's some piece of work! If anything, it might be too cold! Is your radiator & oil cooler still located in the stock locations, using the stock brackets? Too lazy to back-read, but I seem to recall you're using an aftermarket AL radiator & stock oil cooler in stock locations, but probably yanked out the A/C condensor? 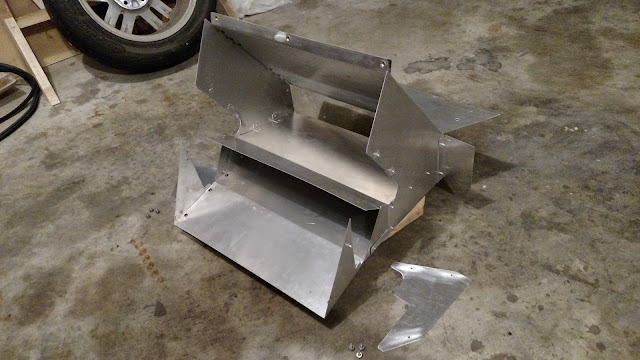 If you drew up a diagram for cutting out the sheet metal pieces, please post it up! That's damn nice work. It looks really good, especially if it's just what you had laying around haha. Might wanna wait on the weatherstripping. Ted is right, it might get too cold. Although it's probably much easier to add right now rather than once it's installed. Everything is still in its stock location. It's a Koyo OEM-replacement Al radiator and I've ripped out everything else. I even relocated the wiring harness so it runs underneath the upper radiator support instead of along that cross member. I have some of the templates I used but it wouldn't be too hard to take measurements off the duct itself since it's a bunch of rectangles and triangles. Too cold, huh? That's not a problem I figured I'd have. My first engine fell victim to overheating so I want to make sure that never happens again. If it becomes an issue I can make some plates to restrict the inlet area. With very minimal ducting - a LOT less that what you have - we got our race-track FC from normal oil temps during street driving down to under 160F. This same FC with no ducting was hitting 250F on track with ambients over 100F. Normally, the thermo-pellet would kick in, but we replaced that with a nut + bolt to have oil flowing through the core full-time. Don't quote me on this, but that thermo-pellet triggers at around 190F? I believe you're also streeting this FC? My situation is a little different...mine is an FD, dual oil coolers, VMIC and in Colorado LOL. Very dry climate, a little less air density at 6000ft, and summer days are usually between 70-90F, sometimes 100F, and winter days are between 20-60F with the occasional 80F day. I think even without ducting my coolant is around 180F and oil around 130F while driving in the summer, and in the winter I've seen my coolant at 165F and the oil at 109F. My water temp sensor is behind the thermostat, which should be the hottest point, and the oil temp sensor is at the filter, so that one is going to read cold anyway. Granted you have a different setup, but still something to think about. It's better to err on the side of caution though, and if you need to you can go back and block some like you said. My buddy has a hard time cooling his FC down too. Last edited by speedjunkie; 02-03-2015 at 07:16 PM.. It'll only see the street for things like break-in, tuning, trouble-shooting, and driving to/from local meets. It's mostly going to be a weekend track day fun car and will be towed to events (like DGRR, if I ever go) more than about an hour away since it has no A/C, heat, or radio and will be obnoxiously loud. I also have the thermo-pellet delete but I left the thermostat in the oil cooler. I figure if anything that will be what gets a workout. If that ends up failing I can look into removing it and adding a restrictor to the oil cooler or an aftermarket thermostat. My setup is similar in regards to location of the sensors but yeah, no turbo so no IC and just the one, big FC oil cooler. I remember reading about the old SCCA IT7 guys using two FC oil coolers in series or parallel without the thermostats to keep temperatures down. I can't remember if they were allowed ducting though so that may be why. 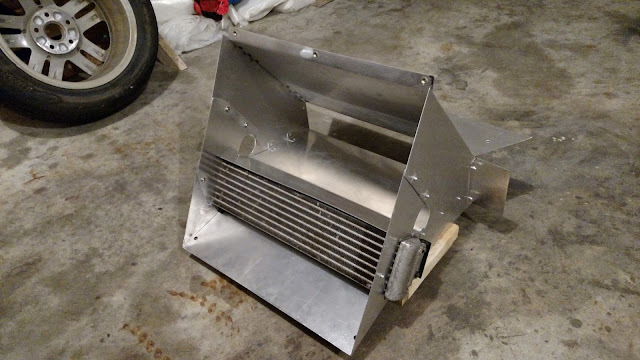 Any reference I use to "therm-pellet" in this thread is in reference to the one located in the oil cooler. I am NOT talking about the one located in the nose of the e-shaft; all our engine have deleted that stupid Mazda design to run oil full-time through the e-shaft, and we don't live in freezing regions. Snapped a couple pics when I stopped by the shop yesterday to drop off the roll bar. The pieces of tape everywhere are holes that are going to be filled in. The shop has some interesting ideas about the roll bar. I need to look into the NASA and SCCA rulebooks to see if it's legal, but maybe someone here knows. I want to keep the bar bolt-in but I wanted more strength at the attachment points so I asked the shop to weld some 3/16" or 1/4" plates to the car. 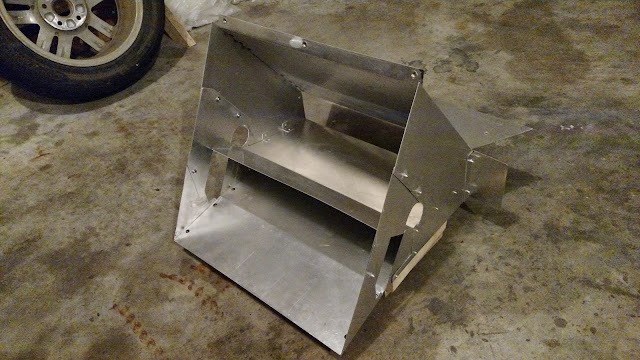 They came up with a neat idea to build little boxes at the attachment points with welded nuts inside. This way the attachment points should be much stronger and I won't have bolts going through the body of the car. Legal? Spent the weekend getting rid of crap in the garage - made $50 in scrap. After that it was too cold to spend more than 15 min. in the garage at one time. Organized wire harness crap and started working on the plate for mounting the RacePak. 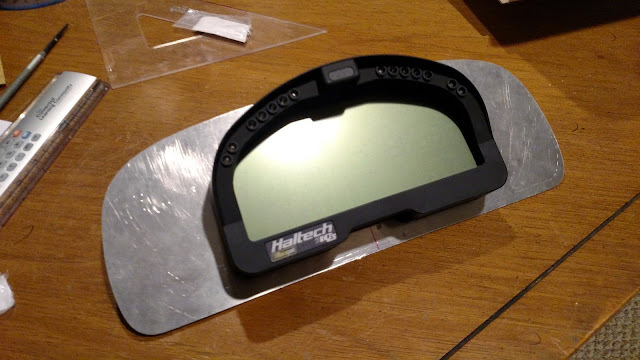 Still need to drill holes for the indicators, attach the plate to the bezel, and paint. Last edited by infernosg; 02-16-2015 at 08:24 AM.. The SCCA rule book is available for free download and the cage rules are pretty well defined. NASA basically copies SCCA safety rules. 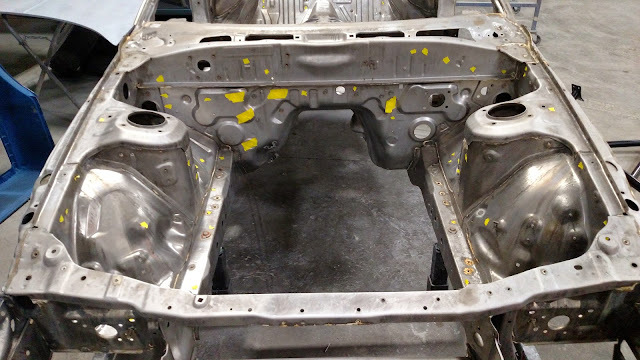 I think, kind of like ASSuming, you need backing plates on the underside of the floorpan for bolt-in cages. The lay-engineer in me likes your idea but I don't know if it will pass tech. Jealous of a clean FC shell. Makes me want to build another ITS car. 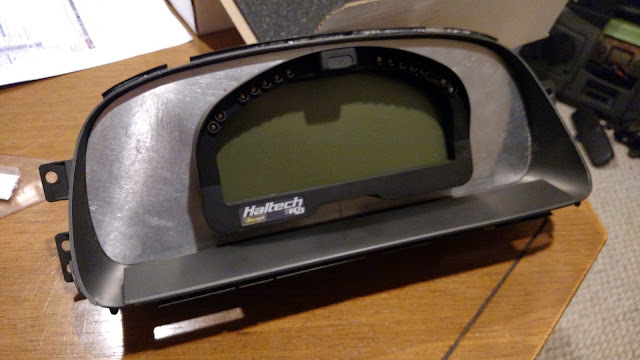 Damn, nice work on the RacePak mount! Especially with the tools you used, like you mentioned. My work never comes out that clean with a Dremel, even after cleaning it up with a file lol. So, the question of legal or not relies on what you intend to do. You mentioned NASA events, but what kind of events? I hopefully don't offend, but if you are not TT licensed yet or higher, your car isn't even required to have the roll bar. You can run through the HPDE groups and even run around in HPDE 4 when you get there and the roll bar is just added safety for yourself. The question here shouldn't be if it is legal or not, but if you feel like that design would be safe. 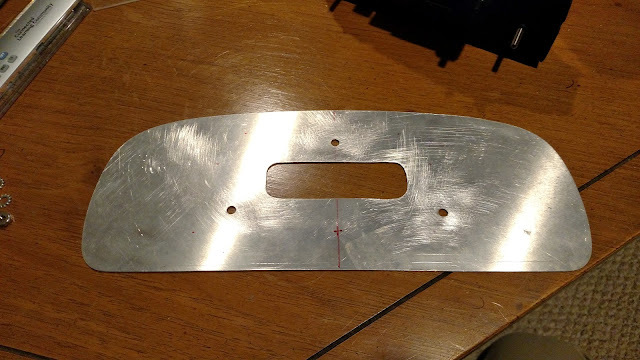 Generally, bolt in bars for convertibles (or coupes) need to have at least an 1/8" foot mounted to a plate no thinner then .120" covering 18sq/inches attached (welded) to the body. Now for some, that .120" surface IS the floorpan, etc. I don't personally trust it, but hey.. that's what is considered 'legal' and it does work ok for rollover protection. That being said, if your body shop fabs a box (very common in weld in cages) that is 1/8" thick, the mounting foot on the roll bar is 1/8" thick and the hardware being used is all Metric 10.9 or SAE grade 5 or 8... I'd say you would pass any visual tech inspection. The entire idea is so that the bolt in cage/bar doesn't punch through the floor of the car in a roll over. On another topic... if you're serious about track use, weld it in. You can even just weld in the bolt in cage/bar w/ the proper footing/reinforcements. We used an autopower 4pt bolt in roll bar in a NASA ESRC rally B-stock FC a long time ago. When we started competing, we just welded in the cage and added the appropriate additional points of attachment per ESRC rules. I'm not trying to be a downer, I've used bolt in cages/bars and am even considering adding one to my RX8 now but I think it's important you really consider what you want to do with the car. If its getting added protection, chassis stiffening, harness mounts, etc then a properly installed bolt in is ok. If its serious motorsports (PT/TT), weld that guy in there and put it out of your mind. Hope this helps... nice build so far man... I've always liked your updates! Yep, read through both the NASA CCR and SCCA GCR and came to the same conclusion. The mechanical engineer in me agrees with you but you can't argue with the rules. While the regulations are for "competition" and I don't plan on going any higher than TT I'd rather conform to the competition rules than do my own thing and get constantly questioned about it. The shell is pretty clean - definitely better than I though it would be considering it spent it's life in WI! Next time I'm at the shop I'll snap some pics of the trouble spots. See above. I was progressing through HPDE when the red car blew up back in '11. I don't plan on building this to be competitive in any particular class but I'll likely do a TT every now and then to compete with friends. This will be a "weekend fun car" only. Otherwise, I understand where you're coming from completely. The roll bar I have (Kirk Racing), when used as intended, conforms to all SCCA and NASA regulations. I understand it won't ever be as strong as a welded-in cage but I'll still have some semblance of an interior and want the convenience of being able to remove the bar as needed. Since I plan on taking this to the occasional meet (e.g. DGRR) I don't want to have to climb over/around bars ever time I get into/out of the car. 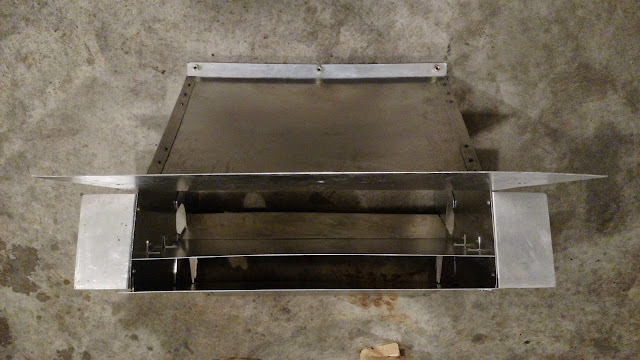 I asked the shop to weld 1/8" plates to the floor pan and rockers to strengthen the mounting points and they came up with the idea I described above (basically a plinth box for a bolt-in cage). A quick Google search didn't find anything similar but the CCR and GCR were both pretty clear about the need for backing plates.